Like my wordpress blog it will include reviews and perhaps also some essays. Synopsis:Can murder be justified, even called the most sensible course of action in some circumstances? Is the life or animals always worth less than the life of human beings? Should cruelty, corruption and greed of big corporations and individuals be condoned just because there’s no better option? What are prisons really for? Young Lemuel Altick will have to find answers to those questions while earning college money as a door-to-door salesman of worthless encyclopedias.One day, while trying to sell his wares to the inhabitants of a dingy trailer somewhere in rural Florida, Lem witnesses a double assassination. The perpetrator, Melford Kean, seems to be far from an ordinary ruthless thug, though. Instead of shooting the hapless witness along with the others he suggests a deal: stay quiet, don’t contact the police, and everything will be fine. It is one of these propositions you simply can’t refuse but it is hardly an end of Lem’s problems.He finds himself drawn against his will into the realm of the assassin, a post-Marxist intellectual with whom he forms a kind of a friendship. Who Melford really is? A charming vegan sociopath, an eco-activist, or a lonely vigilante for social justice? To unravel the mystery and save himself, Lem must descend deep into a bizarre world he never knew existed, where a group of desperate–and genuinely deranged–schemers have hatched a plan that will very likely keep Lem from leaving town alive.What I liked:The plot. I love when a mystery is skillfully done and this one was really refined and complex. It starts slowly - at first it seems nothing fits – we meet a bunch of unpleasant guys who do unpleasant things without even a shred of remorse. 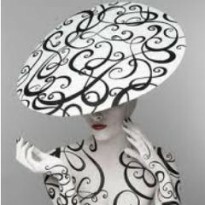 The more you read the clearer it gets, like a jigsaw puzzle which you try to assemble without looking at a model pic. I found it truly entertaining, intelligent and clever.The lead characters. Lem is our usual ingénue who grows up while solving a mystery and saving his life but he is not one of these ‘too stupid to live’ boys/girls who must be led by a hand and constantly watched over by an older mentor. It is true that Melford shoves him towards the right direction from time to time but overall the boy can think and take decisions on his own, mainly because he has been forced to do so from his childhood. By the way the title assassin is a joy to read. Does he belong to white or black hats? His actions will make you change your mind more than once but you will enjoy reading about him.The baddies. They are well-rounded, real-life criminals – those who are successful and skilled, evading the justice by exploring the holes in the system. I liked it very much how the author described mechanisms of different scams, the seamy underworld of an allegedly peaceful backwater town. It ringed true. Even the fact that they used such a foul language didn’t deter me – after all you can’t expect a hardened criminal to speak like the Queen of England or a news anchor.The pace of narration. After first several chapters you’ll find yourself glued to this book. It is highly readable, as all Liss’s novels I’ve read so far.Dark comedic undertones – I LOVE this kind of humour.The death of the major villain. Dear me, it was a bit of justice I wouldn’t have imagined, not in a hundred years – horrible, disgusting, bloody but so right.The cover - it fits the story.What I didn’t like:Female characters. It seems Mr. Liss has a problem here. Compared to two leads, mentioned above (Lem and Melford) the ladies are simply pale and insignificant. Chitra, the fellow encyclopedia peddler from India, is almost like a carton cut-out girl or a prop for Lem – pretty eye candy whose main role is similing, swooning and whispering ‘my hero’. Desiree, the young charge of B.B., a secondary male character, is better but it features in too few scenes to be really a significant player; there is more background to her actions, but she is not strong enough to stand on her own feet. Pity – I would enjoy more of her and generally more gender ballance for sure.Sometimes the book sounded a bit too preachy but fortunately the author never overdid it.Final verdict:David Liss is mainly known as the author of Conspiracy of Paper series (if you can call it that) , three great historical fiction novels which I enjoyed very much. 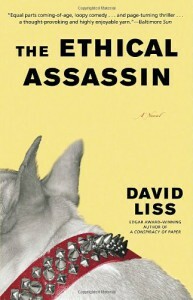 The Ethical Assassin shows that he can write contemporary fiction as well. I recommend this book to all those who like intricate mystery thrillers which focus not only on a simple ‘whodunnit’ but also on more serious issues like animal rights. It is perhaps not a work of pure genius but it will keep you intelligently entertained - you won't regret the time spent with it.